1840 - 1897 Ramchandra Rao Gopal Rao "Appa Sahib Patwardhan"
1897 - 1924 Parashuram Rao Ramchandra Rao "Bhav Sahib Patwardhan"
1924 - 1947 Sankar Rao Parashuram Rao "Appa Sahib Patwardhan"
1733: Defensive and offensive treaty signed with the British. 1759: Jafarabad and Janjira states enter into personal union. 1750? : State split into Bandhora and Jaso. An extinct principality in Kashmir State, Punjab. 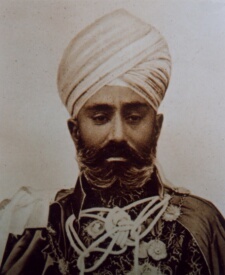 The last Raja was dispossessed by Ranjot Singh. Was founded by Raja Jas Dev of Jammu in 1019 A.D. Jasrotias ruled this state up to 1834 A.D., when it was given to Raja Hira Singh. JATH, a native state of India, in the Deccan division of Bombay, ranking as one of the southern Mahratta jagirs. With the small state of Daphlapur, which is an integral part of it, it forms the Bijapur Agency, under the collector of Bijapur district. Area, including Daphlapur, 980 sq. m. Pop. (1901), 68,665, showing a decline of 14% in the decade. Estimated revenue 24,000; tributeAgriculture and cattle-breeding are carried on; there are no important manufactures. The chief,. whose title is deshmukh, is a Mahratta of the Daphle family. The town of Jath is 92 M. S.E. of Satara. Pop. (1901), 5404. "The family of the Jath chief claim descent from Lakhmaji bin Eldaji Chavhan, headman of the village of Daphlapur. Lakhmaji had two sons Satvajirav and Dhondjirav. In 1680 Satvajirav, who had entered the service of Ali Adil Shall, king of Bijapur, on paying a succession fee or nazarana, was appointed Deshmukh of the sub-divisions of Jath, Karajgi, Bardol, and Vanvad; Satvajirav continued one of the leading Bijapur nobles till the state was overthrown by Aurangzeb in 1686. He assumed independence for a few days, but finally submitted to Aurangzeb, receiving Jath and Karajgi in jagir, and Jath, Karajgi, Vanvad, and Bardol as vatans. Satvajirav's two sons, Babaji and Khanaji, died about 1700 before their father. On Satvaji's death without heirs, Esubai, the wife of his eldest son Bavaji, succeeded. On her death in 1754 Esubai was succeeded by her nephew Yashvantrav. In 1759 Yashvantrav died and was succeeded by his son Amritrav. Amritrav was succeeded by his son Khanajirav, who had two wives Renukabai and Salubai. In 1818 Renukabai made a treaty with the English under which all her possessions were confirmed to her. In 1823 Renukabai died and was succeeded by Salubai who administered the state for ten months and died without leaving male issue The state was then attached by the Raja of Satara, but in 1824 it was granted to Ramrav bin Narayanrav a member of the same family. In 1835 Ramrav died leaving no male issue. 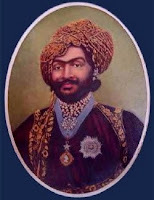 The Raja of Satara again attached the state and managed it till 1841, when it was granted to Bhagarthibai the widow of Ramrav. In 1841, with the permission of the Satara government, Bhagirthibai adopted Bhimrav bin Bhagvantrav. Bhimrav on his adoption took the name of Amritrav. During Amritravs minority the state was managed by Bhagirthibai till her death in 1845. On Bhagirthibai's death Sakhojirav Savant was appointed karbhari or manager, and remained in office till Amritrav came of age in 1855. In 1872 owing to numerous complaints of oppression on the part of Amritrav, the Government of Bombay ordered Captain, now Lieutenant Colonel, West to make inquiries into the alleged grievances. The result of these inquiries was that both the civil and the criminal administration was taken out of the chief's hands. The chief of Jath, who is styled Deahmukh, is a Maratha by caste and ranks as first class sardar. Besides small sums on account of rights in other districts, the chief pays to the British Government a yearly tribute of £473 18s. (Rs. 4739) on account of sardeshmukhi rights in the Satara district and of £640 (Rs. 6400) in lieu of furnishing svars or horsemen. At present (1884) the chief has no jurisdiction. A karbhari or manager has been appointed with the powers of a first class subordinate judge in civil oases, and of a first class magistrate in criminal cases." 1823 - 1835 Ram Rao I Narayan Rao "Aba Sahib Daphle"
1892 - 1928 Ram Rao II Amrit Rao "Aba Sahib Daphle"
1936 - 1947 Vijayasingh Rao Ram Rao "Baba Sahib Daphle"
1761 - 1768 Placed under managers appointed by the Peshwa. "Jind state was founded by descendants of Phool Haryana under the patronage and protection of the Sikh Guru (Guru Hargobind and Guru Har Rai). Jind was a state of Sikh of Siddhu Jat origin founded by grandson of Chaudhary Phul Singh . Chaudhary Phul Singh had six sons namely, 1.Tiloka 2.Ram Singh 3.Rudh 4.Chunu 5. Jhandu and 6.Takhtmal. Area of the state was 1259 sq mile and annual income of Jind state was Rs 30,00,000/-. "Claiming descent from Jaisal, founder of the State of Jaisalmer in 1156, the founder of this Sikh dynasty, Phul, was Chaudhri (Governor) of a country located at the south east of Dihli. Phul’s descendants founded 3 States: Patiala, Jind and Nabha. "Tiloka had two sons namely, 1. Gurudutta 2. Sukh Chain. Sukh Chain's descendants ruled Jind state and Gurudatta's descendants ruled Nabha state. 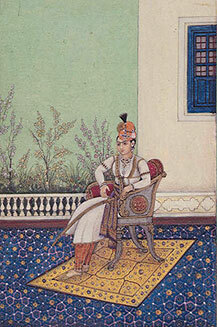 "According to the World Statesmen website, the princely state of Jind was founded in 1763. 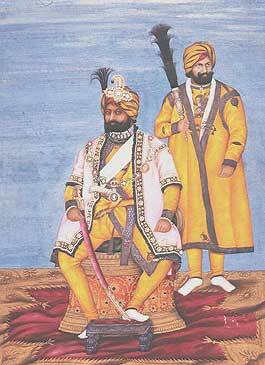 Gajpat Singh ruled under the title raja until 1789, then Bhag Singh until 1819, Fateh Singh until 1822, Sangat Singh until 1834. 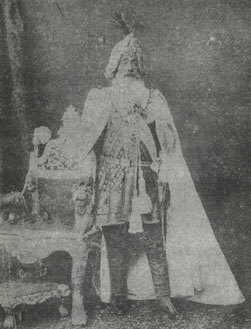 After a vacancy of three years Sarup Singh ruled until 1864, succeeded by Raghubir Singh, who took the title raja-i rajgan in 1881. 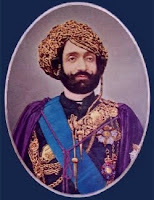 In 1887 he was succeeded by Ranbir Singh, who became maharajaMajor-General H.H. 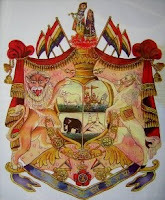 Farzand-i-Dilband Rasikh- al-Iqtidad-i-Daulat-i-Inglishia, Raja-i-Rajagan, Maharaja Sir Jagatjit Singh, Bahadur, Maharaja of Kapurthala, GCSI , GCIE , GBE The word MahÄ�rÄ�ja (also spelled maharajah) is Sanskrit for great king or high king (a karmadharaya from mahÄ�nt great... in 1911 and continued to rule the state until Independence in 1947. "The current prince of the principality of Jind is called Ikwal Samra (12-6-1973), who was trained as an engineer in the United Kingdom." 1763-1789: Raja Gajpat Singh (1738-1789), Raja [cr.1772], took part in the conquest of Sirhind, Panipat and Karnal, made Jind his capital in 1766. 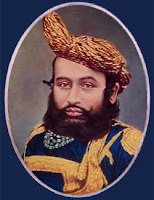 1864-1887: Raja-i-Rajgan Raghbir Singh (1832-1887), Raja-i-Rajgan [cr.1881]. Jowar is situated about 70 miles north of Bombay in the Thana Division. It has an area of 534 square miles, and a population of 37,406 souls. The Revenue is estimated at Rupees 55,000.